Ron Bronstein, a 24-year-old St. Louis native enlisted in the IDF at the end of March 2012 and decided to document his transition from civilian to soldier by dancing his way from start to finish. Bronstein moved to Israel from the United States in 2007 and now serves in the IAF’s Technology and Logistics Directorate’s foreign relations department. “The day I was drafted, I stood excited at the enlistment office and I wanted to document the moment, to preserve the experience. At every stage, from being drafted to the end of basic training, I asked my friends to document me dancing, and that’s how they got to know me, as the guy who every few minutes asked them to film him,” Bronstein told Yedioth Ahronoth. In the video posted to YouTube — set to LMFAO’s “Party Rock Anthem” — Bronstein dances the shuffle through guard duty, kitchen detail, barracks, and parade grounds in his IDF greens. He proudly struts his stuff in IAF dress khakis on train platforms, at his swearing-in ceremony, and in front of military aircraft. Since being uploaded, the video has been viewed more than 350,000 times. 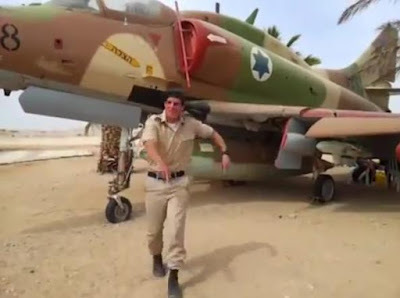 Bronstein’s fans comment that, whereas similar videos of dancing soldiers have made their way onto the Internet, his “was done in good taste,” according to one viewer. The IDF spokesperson did not grant The Times of Israel permission to interview Bronstein. Awesome!!! Thank you for all you and your fellow Israeli soldiers do!